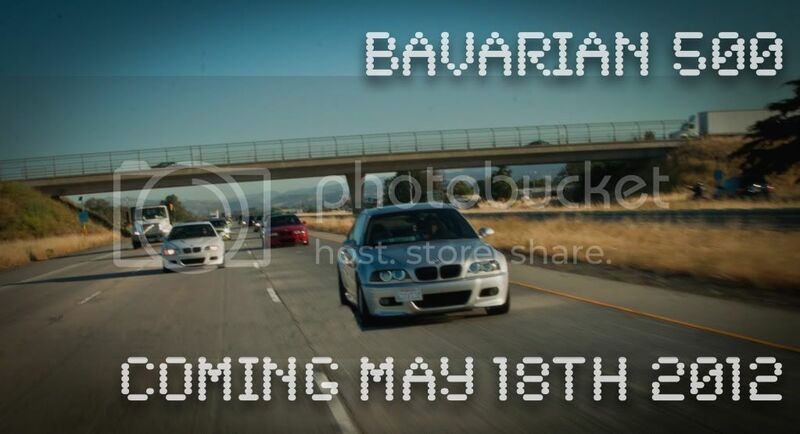 This year the Northern California Bimmerfest Caravan is back and better than ever as the new Bavarian 500. Join us in our rally south Friday May 18th 2012, and enjoy cars, food, community, and over 500 miles of pure driving pleasure. The Rally kicks off Friday May 18th at the Gilroy Lowes (7151 Camino Arroyo, Gilroy, CA 95020). Check in time is 7:30 and departure time is 8:30. Please be on time so that we can get everyone checked in. At check in we will be distributing vinyl window numbers for all entrants. The number you recieve will be noted with your registration so that you can retain the same number for next year. A food truck will also be there to serve up food before we kick off. Please bring a two way radio for the drive. We will be traveling down south via the 101. The route is available by clicking the map on our homepage. We have arranged two pitstops: the first for gas and coffee and the second for lunch. On Friday and Saturday night we will be staying at Pasadena/Monrovia Courtyard Marriott (700 West Huntington Drive · Monrovia, California 91016 USA). A group rate has been arranged and the rates will be $94 per night for a room with a King bed and $104 per night for a room with two Queen beds. All participants should fill out the registration form on our website. Registration will secure your place in the caravan and your own rally number which can be affixed to your windows for the event. Rally numbers will be given out at random for free, however, requests for specific numbers can be processed with a $6.00 printing fee. The final event of the weekend will be the return trip on Sunday May 20th at 10:00 am.